Seleccione su servicio preferido, listo para comenzar a ahorrar? Listo Para Adquirir Energia Solar! 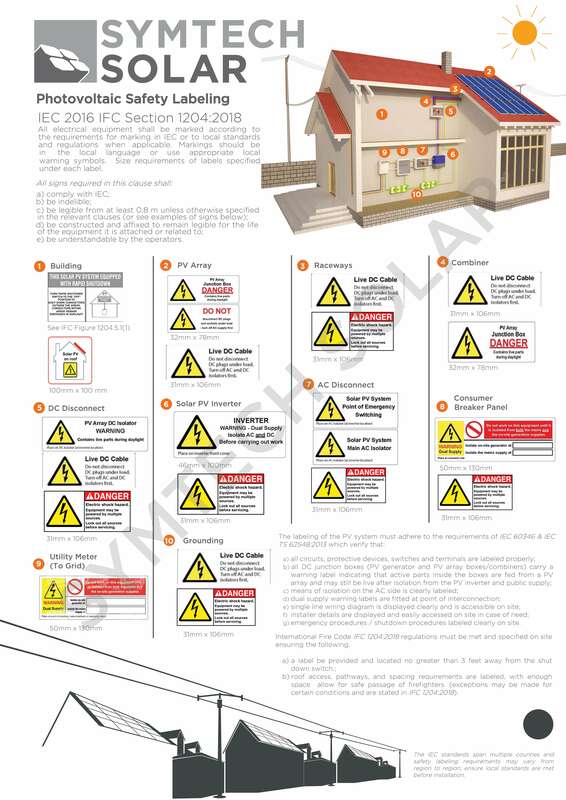 Solar Panel Safety Labels – Why Comply? The recent commercial success of solar PV power can be linked to many factors including increased pressure on governments and NGOs to diversify the worldwide energy mix from conventional generation means to renewables; as well as efforts to meet environmental targets. Another factor, and arguably the reason for solar power’s accelerated growth within the renewable energy market, is the long term reliability of the modules and the system as a whole. The safety of the technology and equipment is embodied by the safety standards put in place by a number of different global and local organizations. Solar panel safety labels, for example, are used and are inherent in maintaining this reliability, forming the primary focus of PV safety priorities. 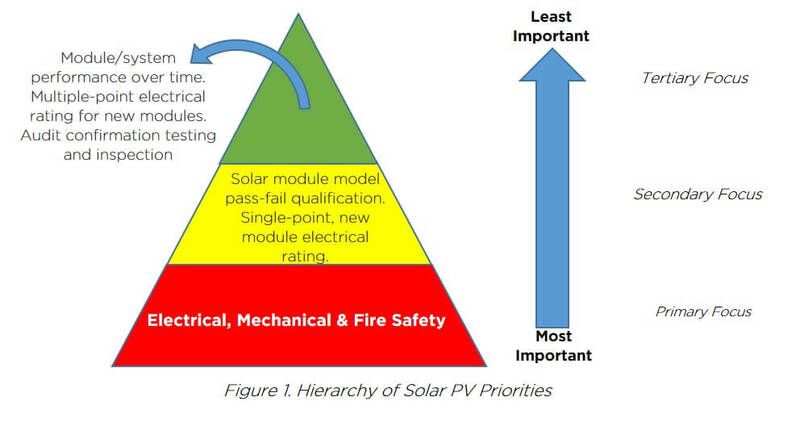 Figure 1 below illustrates the hierarchical structure of the solar PV industry priorities; of which electrical, mechanical and fire safety concerns are fundamental. Who has the authority for solar PV system safety? The authority which conducts these safety tests and therefore dictates labeling requirements will differ depending on where you live or where your business operates. Many countries have a National Electro-technical Commission (NEC) that will supply safety information on the proper design, installation, and specification of the solar PV kit in use. For pretty much anywhere else, it will be the International Electro-technical Commission (IEC). 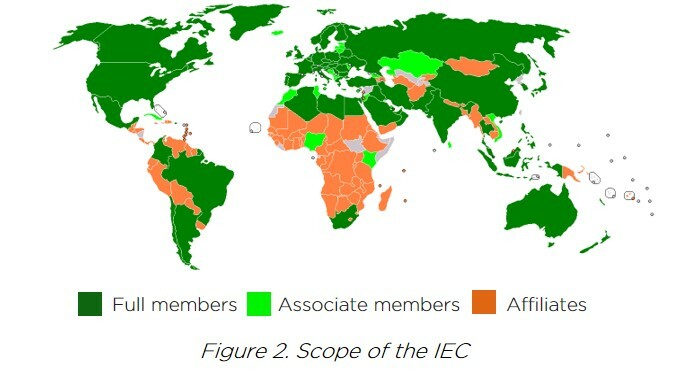 Today, the IEC is the world’s leading international organization in its field, and standards are adopted as national standards in 82 member countries, as well as many other affiliate nations (see figure 2). Within the industry, professional designers, installers, and engineers all agree that there is no absolute consensus on defining what is the ‘right’ way to administer photovoltaic infrastructure labels on a global level; requirements will vary hugely from location to location due to policies and or environmental changes. What can be said for certain about these labels is that they reflect a system of rigorous safety tests (whether IEC or NEC) and they are inclusive of all individual components as well as the combined solar PV system. 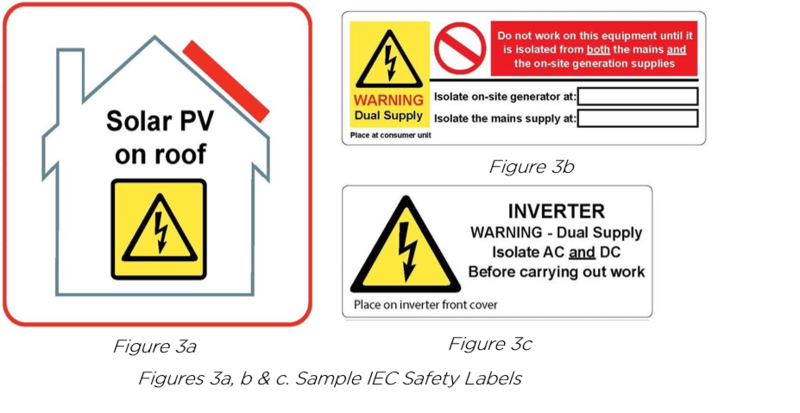 Figures 3a, b & c are examples of safety labels required by the IEC to be placed on different components within the system. Some are purely a hazard sign to notify quickly the present danger (3a), others contain instructions on how to safely go about work (3b) and what to do to make the system safe. As no two PV systems are the exact same once installed it is essential to have customized labels for a specific system, as seen in Figure 3c, to inform workers where components are located. The first group, and potentially the most important, is people with little knowledge of electrical systems or dangers of equipment operating at high voltages. Customers and civilians may not necessarily know what components are particularly dangerous and thus labels provided on the PV array or consumer breaker panel will alert them that the electrical components are live and not to be touched before disconnecting DC plugs and isolating the system. Labeling also gives maintenance workers and electricians information regarding the system so work can be carried out more quickly and safely. The International Fire Code took steps in defining specific requisites for labeling to make them highly visible in emergency situations, allowing fast recognition of all potential hazards by firefighters. System verification is an essential process with any electrical system, and the final group ensures the smooth running of your PV system, as, without the proper labeling, you may not pass inspection and therefore have to shut down the system. The IEC dictates hazards be mitigated by tests “prior to energizing the system”, ensuring continuity between all labeling of PV systems. Make sure to follow your local guidelines (IEC/NEC & IFC) on how to label your kit properly to avoid any problems with passing inspections, and, more importantly, any safety hazards! Listo Para Adquirir Energia Solar? Are you interested in purchasing for? (C) 2008-2018 Symtech Solar Group. All rights reserved. SYMTECH SOLAR, the SYMTECH SOLAR logo and SYMPACK are trademarks or registered trademarks of Symtech Solar Group in the USA and other countries as well.